Something you will never, ever hear me say about a café, bar or any other place is that it is ‘so Melbourne.’ I know what people mean when they say that. I can even see what they’re talking about in my mind’s eye. It’s some kind of kitch, bentwood chaired, astro-turfed, bicycle-wheels-dangling-from-the-ceiling, exposed-vintage-lighbulb-studded hole-in-the-wall with hipster clientele and fashionably–mussed student waiters. It’s zany. It’s ironic. It’s ‘more european’. But I refuse to use this term. I’ve never understood the Melbourne/Sydney rivalry, mostly because it is so one-sided. People from Melbourne will always try and sell it to you, as if Melbourne invented any or all of the following things: coffee, hipsters, black clothes, laneways, graffiti. They’ll give you one million reasons why it’s better than Sydney. But Sydneysiders don’t give a damn, and I in particular don’t give a damn as long as the coffee’s good. We all like upcycled vintage sideboards, we just don’t talk about them all the time. Oh and p.s.- there ain’t no such thing as a long macchiato. Klink Handmade espresso is the kind of café that would be right at home in Degraves street or equivalent, but I won’t hold that against them. You’ll find it in the foyer of the Gaffa gallery, housed in a strawberry ice cream coloured heritage building. It’s on Clarence street, near the astro-turfed Grandma’s Bar and a couple of other coffee places with good reps. There’s not a lot of room to sit, so if you’d prefer takeaway you can order through the window. Klink, like The Kick Inside uses Golden Cobra espresso. I wasn’t disappointed with my macchiato as it came complete with a jug of frothed milk, just to be on the safe side. That was helpful as my coffee companion found her espresso a tad bitter and so ended up with a macchiato after all. Sit down coffee is expensive here- $3.40 for a macchiato. But it’s a good place for a quick coffee and a chat. So, what’s an expression that drives you mad? ‘More european’ is probably it. I’ve been guilty of using it heaps myself. Loved your description of the cafe! Like Lonsdale Street Roasters in Canberra. If I had a trendy cafe, I’d put my milk crates out near the smelly dumpsters so the hipsters would have to drink near the stinky garbage. They’d probably think it was ironic though. You must agree, it does look very Melbourne. I’m kidding! I’m with you on this annoying expression. Every time I hear it my eyes roll back so far I’m about to fall over. And you’re right, nobody in Sydney (I speak for all of us) cares about our southern neighbours. I guess Melbournites do it themselves with things like “the Paris-end of Collins St”. “New York style” is another catch phrase that irks me. A friend who lives in Melbourne once said “food in Sydney is good but in Melbourne is exquisite”. I wasn’t impressed when I was there, I tend to think that each city has good and bad cafes and restaurants (even Canberra! ), it’s only a matter of finding them. I didn’t feel much of a special vibe in Melbourne, either, there was a bit of everything, as in Sydney. @Gaby – I like Melbourne, I really do, but I feel it’s over-hyped. The thing is, if people didn’t go on and on about how incredible it is, I reckon I’d be much more impressed by it. By doing that, they’ve raised my expectations to ridiculous heights that can never be met. And I agree that you’ve really got to get to know a place (especially somewhere like Canberra, where everything is hidden). But Sydney has always struck me as a lot more exciting than Melbourne. I like Melbourne for offering things which Sydney doesn’t, and I like Sydney for offering things which Melbourne doesn’t… Actually, that would apply for all places which I visit! Well put! I agree that Melbourne has some great things on offer, as does Sydney. I guess terms like ‘so Melbourne’ are short cuts, but they’re also clichés and that makes for sloppy writing. I think Mademoiselle sums it up nicely there, and I’m not going to say any more on Melb vs Syd, but I’m still looking for a *great* coffee in Sydney and this trip I’m going to find it! Thanks for stopping by. I’m glad my blog came up in your search! 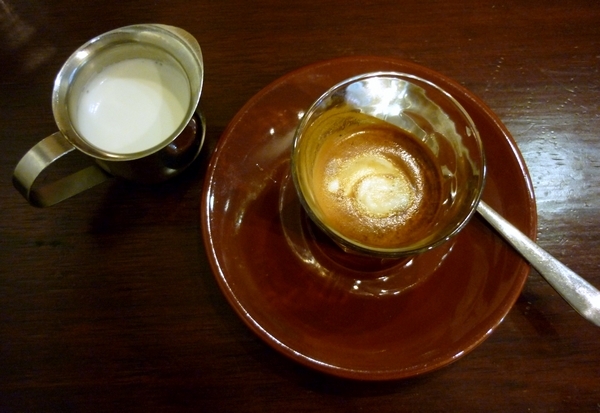 My argument re: the long macchiato is simple: a macchiato is an espresso with a dash or ‘stain’ of milk. Thus if I ask for a macchiato, that is what I should get. Usually in Melbourne they will ask ‘long or short’ when you order one. But sometimes they don’t, and I end up with this travesty of a drink known as ‘the long macch’. My reasoning is that either there is a macchiato and a long macchiatto or there is just a macchiatto. In other words, the long macch is not the default drink, macchiatos do not come in two sizes, short and long, but rather they come in ‘normal’ or ‘default’ size and that mutant aberration, the long macchiato. It is an irrational pet peeve of mine. Where are you thinking of moving? OK I understand your reasoning here and I am normally a stickler for all things good and proper, but I also sometimes cave in at times for example ordering a “latte” rather than a “cafe latte”. I did however try ordering a “macchiato” today and then got the “short or long” question…it seems to be a Melbourne thing or something! I think ordering an espresso with a small side of milk is the way to go though. I’m just visiting Sydney over Easter (mainly for the Annie Liebowitz exhibition) – very happily entrenched in Melbourne though Sydney calls every 6 months or so! Well, ‘latte’ is acceptable in Australia but not in Italy. I should probably bite the bullet and say ‘long mach’ is the standard in Melbourne and not Sydney. But I don’t wanna! I’ve yet to find a better coffee along the Central to Cirq Quay strip. Not sure if its the Cobra beans, its freshness or the barista but I love the roasty aroma of the coffee upon first sip. So glad I am working in the area for the next few weeks as Klink is the perfect example of what I think makes close to the perfect coffee! I know what you mean, Howard. And I love a coffee shop you can smell from a block away. Heaven!